You asked, and I’ve finally delivered! 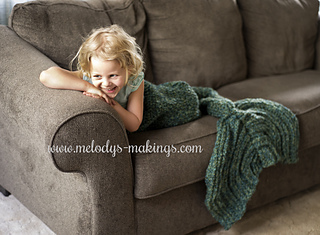 Here’s the crochet version of my popular Mermaid Tail Pattern! 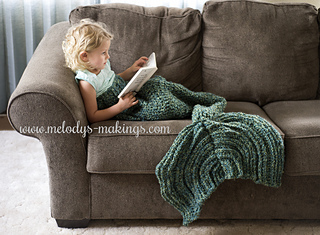 Make your little girl the prettiest fish in the sea with this adorable Mermaid Tail Blanket/Lapghan Pattern. This is a beginner-intermediate level pattern. This pattern calls for Super Bulky (6) Weight Yarn and Size 9.0mm (M) Crochet Hook (or whatever size is needed to achieve gauge). I am always available to answer any questions you may have. You can contact me at melody@melodys-makings.com.